Yesterday, German TV showed an Austrian documentary about the art collection of the Princely Family. The video is available here. In case you understand German (or simply admire looking at art and architecture), she documentary is a must. Entitled "The Prince and His Treasures: Hans Adam of Liechtenstein", it features interviews with Fürst Hans-Adam II, Hereditary Prince Alois, Prince Constantin and his wife Princess Marie about the family's art collection and other ventures. 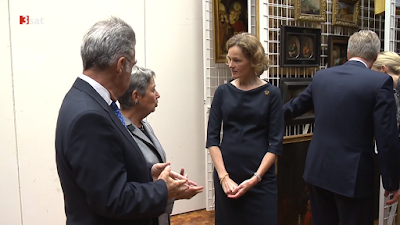 The documentary includes many interesting tidbits about the Princely Collection of the House of Liechtenstein. It is revealed how the family managed to smuggle art out of Nazi-occupied Austria (they simply put name tags of lesser known artists on them and the German border guards didn't notice), that they invest 800,000 euros every year into the restoration of art works and that Prince Hans-Adam himself likes to collect bronze statues as they are very easy to keep and don't require specific lighting or temperatures. The documentary also gives a glimpse into the art cellars below Schloss Vaduz - have fun watching it!